Happy hump day crafty friends! 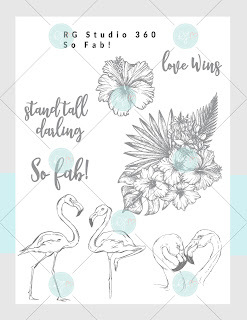 Today I am sharing a card I created with the RGStudio360.com So Fab Digital Download Collection! Here’s a look at my completed card. It is a standard A2 size. It has a black cardstock base and then I added a piece of patterned paper in a bold black and white stripe. I then cut a smaller black mat and then a white mat. Here’s a closer look at the gorgeous flamingo image from the collection. I colored it with my Copic Markers and then cut it out with a scalloped heart die I had in my stash. The heart is from White cardstock. I colored it with some of my Pebbles chalks to give it a very light shade of color. I used a banner die I had in my stash and then added the sentiment on top of that. I layered al of the pieces onto a black circle. I used some foam tape between the layers to give them a little extra lift/dimension. Here is a closer look at the white background. I used a grunge stamp I had in my stash and stamped the blue. I then splattered a little green from my RG stash. I finished off the look by adding in some dew drops. Here is one last look at my completed card. What a summer fun card of encouragement. I hope you are inspired to create your own! pick up your download set today!